EUR is under pressure due to Germany Export and Import reports while it is being supported by the strong Trade Balance. EURUSD is also under the influence of M.Draghi’s comments. 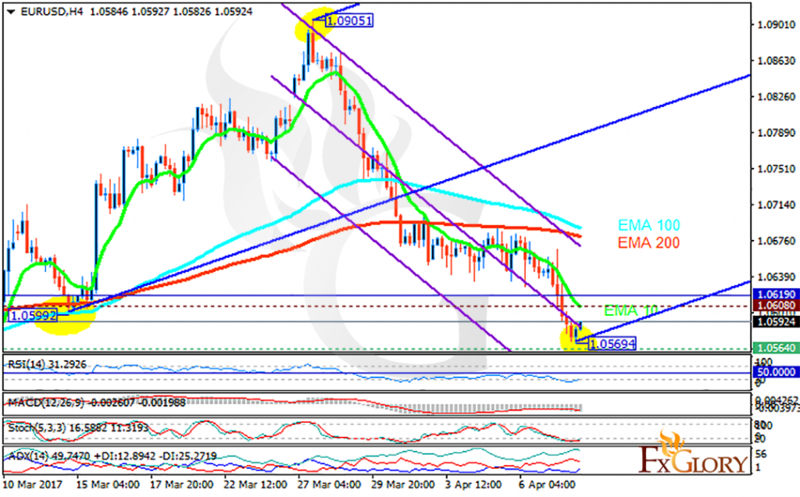 The support rests at 1.05640 with resistance at 1.0608 which both lines are below the weekly pivot point at 1.06190. The EMA of 10 is moving with bearish bias along the descendant channel and it is below the EMA of 100 and the EMA of 200. The RSI is moving horizontally in the oversold area, the Stochastic is moving in low ranges and the MACD indicator is in negative territory. The ADX is showing buy signals. The price will rise within Andrews’ pitchfork targeting 0.61 area.